Changing the color of objects is a great way to add a personal touch to your diagrams in Social Tables! To change the color of an object, click the object to open the right editing panel. 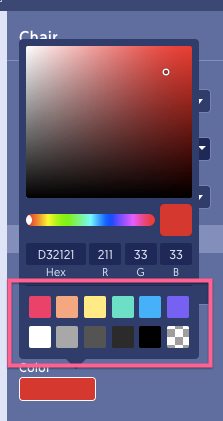 Clicking the color option will bring up a color editing menu, where you can select from pre-made color options, use the color map, or enter hex color values. The bar at the bottom of the color menu shows default colors, which is a quick way to recolor your chairs. The checkerboard option is a transparent color, which will make the interior of your object transparent. You can also use the color map to have a visual way to finetune the color you desire. 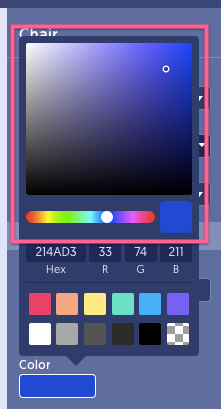 You can change the primary color by clicking a selection on the horizontal color, and change the shade of that color by using the gradient map above. 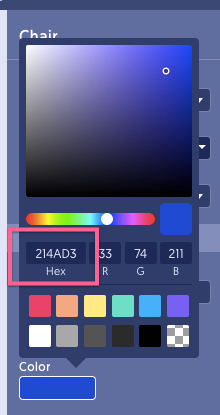 If you know the hex value of the color you would like to change, you can copy and paste that value into the hex box. What can I change the color of? Only standalone chairs and tables can have their color changed. Tables can have their color changed using the same process, but the chairs connected to tables cannot. Chair colors can also only be edited on default Social Tables objects. Catalogue chairs have a predetermined color that cannot be edited.